Preface. Welcome Address (J. Weitkamp). Recent Research Reports. I. Synthesis (22 papers). II. Characterization (33 papers). III. Modification (13 papers). IV. Catalysis (26 papers). V. Adsorption and Diffusion (14 papers). VI. Theory and Modelling (11 papers). VII. Structure (13 papers). VIII. New Materials (5 papers). Full-Length Paper. Alkylation of aniline with methanol on beta and EMT zeolites exchanged with alkaline cations (P.R. Hari Prasad Rao, P. Massiani, D. Barthomeuf). Index of authors. Index of subjects. Transcripts of discussions. List of participants of the 10th IZC. This book is a supplementary volume to J. Weitkamp et al. 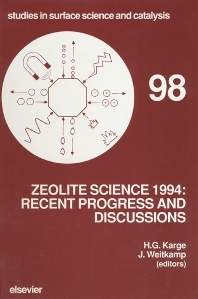 (Editors), Zeolites and Related Microporous Materials: State of the Art 1994 - Proceedings of the 10th International Zeolite Conference, Garmisch-Partenkirchen, Germany, July 17-22, 1994. The larger part of this supplementary volume contains full texts of the Recent Research Reports, which were presented as posters, and the discussions of all the lectures and posters. One full paper is included, because one page was missing in the version published in the Proceedings. A complete list of participants is also included.